The fledgling National Vintage Motorcycle Drag Racing Association has been in need of a sort of clearinghouse/communications center since its inception. Well, due to the wonders of the Internet, there is something now in place. Please register, give us your thoughts, and bookmark the site. We need your feedback as to what you would like to see, what you think should be done to draw in more participants, and please let us know if you would be interested in participating in an event if one is held in your area. And maybe, just maybe, we can finagle some of the old timers to let loose of their long guarded speed secrets! With this post I am instituting a new category on this blog (for those few who may notice such things). Not of sufficient length to be considered "Lessons from the Pulpit", I have decided to label the new category "Short Shots" - not to be confused with the Harley exhaust pipes known for looks and not performance - but rather something more along the lines of "Short Shots in the War Against our Sinful Nature. Certainly what is laid out here in this section of Psalm 2 is as true today as it was the day it was written. History shows us that with very, very few exceptions those in the positions of kings and rulers have always followed the example of the father of lies in rebelling against their Creator ....and it is not the leaders alone. Submit to God and to his laws? NO! Truly God's word is as burdensome as a slave collar riveted around their necks; constantly bearing witness against their sin. They are far too proud to submit to Jehovah, and they love their sin far to much to admit it as sin. Better to rail against those who would follow the Lord and to rail against the fact there even is a God. Their hearts are set against truth as if made of stone. But plotting against the Lord is a vain thing. Nothing changes the fact that there is a Creator and there is a coming day of judgment. The good news is that it doesn't have to be that way. The Psalm ends with this point of gospel light; "Blessed are all they that put their trust in him." Turn from your sins, put your trust in Christ's payment for those sins and you will no longer be counted among those who rage against God. I did take a few days off recently to attend the NVMDRA vintage nationals in Harrisburg, Illinois though. We have to enter that story at a point about a week earlier though. A week ago Sunday afternoon, I decided it was high time that I started the Knuckledragger to check out a few things. Number one was how it would react to dropping the clutch at RPM on dry pavement. Due to various minor setbacks since I did the initial start up on the Knuckledragger late last summer, the only running under power has been in the "burn out pit" here at the shop. Now, the Knuckledragger is set up to replicate a mid '50s drag bike as much as possible. As such, it has a vintage transmission which had been converted to a two speed (third and fourth gears only). Along with the lack of gear reduction in the transmission, it was also outfitted with a 28 tooth VL trans sprocket necessary to fit the early '30s VL frame. Add a new M&H 5" drag slick with traction capabilities exceeding '50s era tire technology by multiples of 10 and you can begin to see my concern. The second item I wanted to get a better feel for was how good the brakes work. Stock springer front drum brakes are notoriously bad. Often, they will do little more than hold your bike from rolling backwards when stopped on a hill. I had done my best to make this one work to the best of its capability, but did it? The rear brake is of course also a stock '40s era drum. These rear brakes maintain a much better reputation than the fronts, but they are after all still just a rear drum brake. It would be nice to know in advance how well the brakes would (or would not) stop me. The third item I wanted to check out was the shifting. The original (to this trans) set up was just not something I could make myself like. So, even though the bike only needed to be shifted once, I thought it important to know it would happen. But, of course things did not go exactly according to plans. Somewhere along the way of making all these plans I neglected to put a fresh charge on the starter batteries. Strike one. Although the Knuckledragger did start, before I got it off the rollers, I managed to let the motor die. That is when the weak state of the batteries manifested itself. After a quick charge we managed to get the bike running again; only to do a repeat performance of stalling it. A few more repetitions of a three stooges type starting drill and I finally got the bike to the end of the parking lot and turned around. But now the engine was audibly running "sour." Now what? A valiant attempt to bring the RPMs up and drop the clutch resulted in stalling the engine ....again! Which brings us up to the vintage race this past Saturday. Once we were set up in the pits, I would still need to start the Knuckledragger and adjust the low speed mixture. I had a pretty good idea of where I had adjusted the high speed, and so was less concerned with that. Most of the alcohol for the high speed circuit is supplied by fixed jets inside the float bowl, so I was using the "power" needles more like trimmers, even though with the M35 bodies it is capable of supplying a goodly amount of fuel. Once the carbs were back in adjustment, I was ready for a pass down the track, still with the same three concerns that I had not addressed the previous weekend. Would the bike launch, would it shift, and if it did those two things, would it stop? They say with age comes wisdom ....yeah they say that, ...but "it ain't necessarily true." The whole issue of shifting, while it would have been nice to test ahead of time, was not something that I was too worried about. Stopping on the other hand, is a fairly important part of drag racing, though to be honest it was not something that worried me too much. I have been off the end of the pavement enough times on a dragbike with good brakes that I was confident that the speeds involved would not make it an issue. The "launch" however, was a whole 'nother matter. My biggest fear was standing the bike straight up. I had never been on a bike with a drag slick and no wheelie bars. Like I said, the tire on this bike provides way, way, way more traction than anything available back when drag bikes were built the way this one is. The chances of recovering from such a launch without major damage to the bike, not to mention myself, are pretty slim. Nearly as scary though was the flip side of that equation (no pun intended) where I bog the motor or even kill it. That would indicate a lack of power and reflect poorly on my engine building ability. Talk about embarrassing! Now that's something to worry about! I wound up making two passes down the track on Saturday. I must say, I have mixed emotions about the results. First I'll describe how it felt from the pilots seat. On the first pass, I decided to throw caution to the wind and rev the motor pretty good before dropping the clutch. It felt like I was spinning the rear tire hard with just a hint of fish tailing. Somewhere between 100 and 200 feet it seemed that the tire finally found traction and the bike pulled like a freight train. When I shifted to high gear I had to let off the throttle (due to an unsolved issue with my shift mechanism) and when I got back on it the clutch broke loose badly, only starting to grab again just before the finish line. I fully expected to receive reports of at least a haze of tire smoke from the first part of the pass. After wearing gloves to remove the now blue steel clutch plates and laying them out to cool, John Endrizzi (my volunteer pit crew for the day) and I found a fairly flat piece of concrete to "resurface" the fiber plates on. A little adjustment on the shifter and we were ready for one more pass, just in case our back yard clutch repair was successful. This time my second to worst fear was realized. I stalled the engine at the starting line; no fault of the engine, I had forgotten to open the petcocks and ran the float bowls dry. Quickly back to the rollers and restart the Knuckledragger. The second pass was much like the first, with the sensation of a lot of tire spin, though not quite as much as on the first pass. Then, again the feeling of the engine pulling like a freight train. The shift into high gear worked essentially as designed this time, or at least a slow motion version of it. This time it took most of the shut down area to get the bike stopped, owing to the mediocre brakes. So what's to have mixed emotions about, you ask? Well, there is this. My wife, after helping to start the bike each time, grabbed a video camera (one she had never used before, no less) and managed to record the passes. The video shows no tire smoke, in fact it is inconclusive as to whether the rear tire is spinning at all. Is it possible that what I perceived as tire spin was only clutch slippage? Don't know. If you watch the video closely, on the second pass you can see what looks like a significant wobble in the rear wheel. It's not. After checking the bike over closely since seeing the video, I have come to the conclusion that the rear section of the frame was twisting from the combination of traction and horsepower. I hate to give up the look of the 5 inch slick, but I believe the best solution is to put a tire on the bike that more nearly mimics the traction capabilities of the era. After all, the frame is at least 75 years old. Overall, the weekend could really only be counted a success for my wife and myself. We finally got the Knuckledragger down the track, and left with only minor issues to sort out. We had a great time and did a little sight seeing on the way home. The down side is that turn out for the race was what one participant called "a disaster." Taking place at the end of Sturgis week may have been a big factor, as well as glitches with the advertising. But, just as the Knuckledragger came away in need of some "fine tuning" to work better next time, so the NVMDRA came away with some fine tuning to be worked out. Plans are already in process towards both those goals. It's not every day that somebody walks into my shop with a really cool piece of vintage speed equipment ....but it did happen recently. My friend Teach came in to finish assembling a set of Knuck heads that I had reworked for him, and with him he had a Seeley manifold that had recently found its way to him. 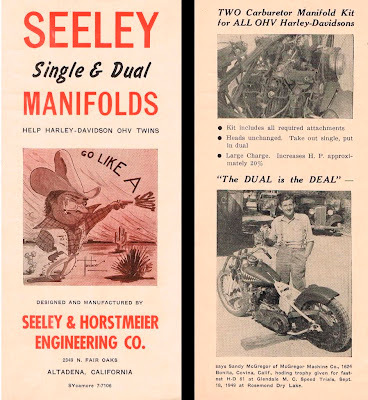 To be perfectly honest I had never heard of a Seeley manifold, and at first glance I thought it was the same as a manifold that I had built 15 or 20 years ago. At the time, I assumed that I was the first one to come up with the idea. Of course the truth is, there is no new thing under the sun (a very wise man said that a very long time ago). Judging by this vintage ad someone beat me to the punch by about a half a century! 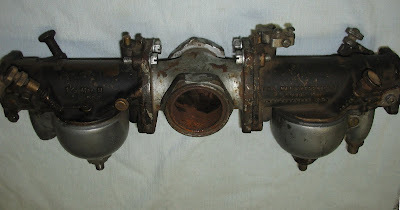 Closer examination of the Seeley manifold, however revealed that it was indeed different than what I had built. You see, the Seeley has the clever addition of a diagonal plate which separates the manifold into two equal individual runners, whereas mine was simply open so that both carbs fed each cylinder. 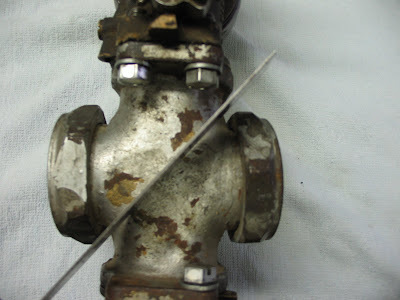 It's little difficult to photograph the actual divider (as shown above), however in the photo below, a straight edge placed on the outside of the manifold shows the orientation of the internal wall that separates the two intake tracts. So, how well does the Seeley manifold work? Well, the proof will be in the pudding, so to speak. The vintage advertisement claims a 20% increase in horsepower. Is that accurate or is it hype? It is obvious examining the manifold that the cross section is visibly smaller at the divider wall. Not that there is anything that Mr. Seeley could have done about this; there's only so much room between the heads. So, while Teach was installing the rocker boxes on his heads, I took the opportunity to put the Seeley manifold on the flow bench. 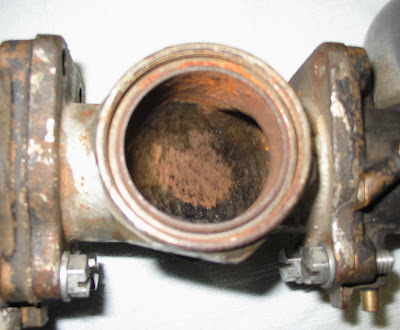 The bench confirmed that there was a restriction in the Seeley manifold. How much of a restriction? Well, comparing it directly to a stock Linkert manifold, (each checked with a velocity stack directly attached to the manifold - no carb) the Seeley is 22 cfm down. That's not the whole story though. Flow testing both manifolds with an M35 carb attached showed it was only down by 5 cfm (because the carb was more of a restriction than the manifold). Now, 5 cfm at a 28 inch test pressure is not a huge amount. It could very well be that a better "tuned length" effect of the individual runners on the Seeley manifold could indeed lead to more power despite the slight loss of cfm. Or not. We'll just have to wait for a report back from Teach as to real world performance!